Nougayrede Bas, near Cahors in the Lot Valley. 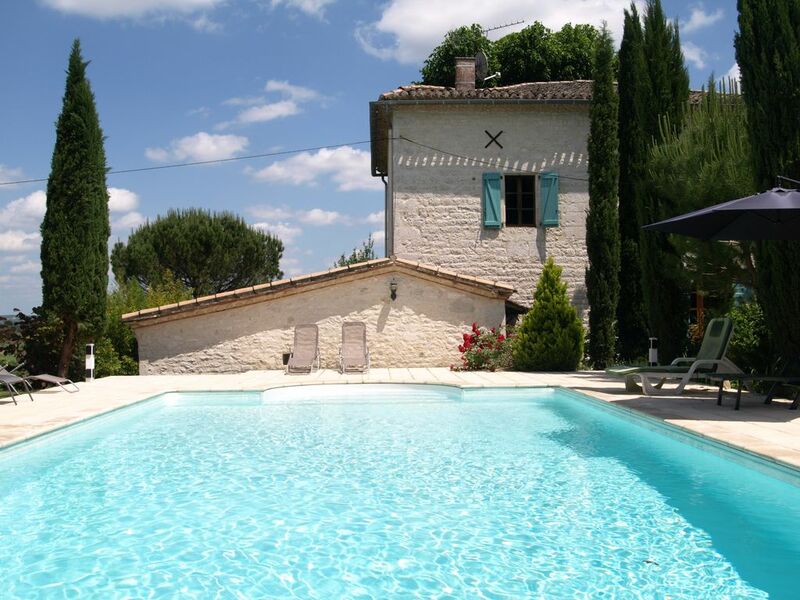 Traditional farmhouse and converted barn, refurbished to a high modern standard with a large private pool. Five bedrooms sleep 12. The property stands on its own in an elevated hillside position, surrounded by spellbinding vistas of farmland and hilltop towns. Two miles from shops and restaurants at Montcuq. Twenty miles from Cahors (historic regional centre) well placed for visiting one of the loveliest parts of France. Pool with underwater lighting, 40x20ft. Grounds of one acre, parts in deep shade. Garage plus ample parking space. The Lane family has owned Nougayrede Bas since 2001. We use it for entertaining and family parties, as well as for letting. We chose Nougayrede Bas as picturesque a base in the lovely French region fed by the rivers Dordogne, Lot and Tarn. We were enchanted by its views. Since buying it we have renovated it throughout. It dates from the C17, we believe, and it was a working farm right from its origins up until the early 1970s. After that the house was used for many years as an artist's country studio, until we bought it and converted it for holiday use. We love the solid dignity of its architecture, its champagne-coloured stone walls, its all-round panorama, and the constantly-changing light on the surrounding hills and valleys. We love hearing that our visitors enjoy all these things too. They always sing the praises of its hillside position and its views, its traditional farmhouse character, its expansive pool and its overall sense of spaciousness. They often come again. 5 x bathrooms. Large family bathroom with bath, separate shower cubicle, WC and hand-basin. Each of bedrooms 2 - 5 has its own bathroom en-suite, with shower, WC and hand-basin. Oil fired with radiators in the farmhouse. Electric heating in barn. In separate laundry-room. Heated for drying. Large, great character. Logs provided. Room for plenty of cars. The interior is roomy and full of character. Huge open-plan living area. Comfy sofas and armchairs. Dining tables to seat 12. Sat TV, video, HiFi, CDs. Telephone and broadband connection. Second sitting room for study, cards, games. Larder-type fridge with good capacity. Modern fitted kitchen with electric range cooker, induction hob, oven, extractor and down lights. Double sink, big larder-type fridge, separate freezer, dishwasher, microwave, toaster, electric kettle, good stock of utensils. Plenty of fiction, plus books on France and French history. Good selection of board games. Good selection of classical CDs. About an acre of land. Mature trees giving plenty of shade when it's hot. Attractively planted with roses, vines &c.
Elevated covered dining terrace with dining for 10. Southerly views. 40 feet x 20 feet. Sunbathing terrace all round, paved with stone flags. Pool house for sitting in the shade. Notes on accommodation: There is full oil-fired central heating and a large open fire, with logs provided in season. The barn is electrically heated. Outside: Converted barn contains two spacious bed-sitting rooms and an entrance hall/kitchenette. Large private pool 40x20ft, underwater lighting, enjoys direct sunlight all day. Depth 4 ft to 7 ft. Roman steps into the shallow end. Water cleaned by automatic pump and filter: chemical balance monitored regularly. The pool is surrounded by a sun terrace, with sunloungers and wide views. Shady pool-house equipped for barbecues. Grounds of one acre, part shaded by trees. Walnuts, figs, plums, vines. The plot is surrounded by undulating farmland (sunflowers, meadows) giving onto distant views. Utility Room: Separate laundry room with washing machine & water-softener. Cleaning / Towels / Linen / Maid service: English manager lives in the village. Bed-linen and towels are provided. Property is cleaned before each let. Other: Pretty external dining terrace at first floor level for open-air living, shaded with commanding southerly views. Dining space for 12. Steps down to garden. The A20 autoroute from Paris has an exit at Cahors, and from Cahors, Nougayrede Bas lies 20 miles to the SW.
From Dieppe, Le Havre or St Malo, the house can be reached in an easy day's driving, and from Calais (ferry or tunnel) after a longer day's drive. Toulouse,Bordeaux & Bergerac airports, all within 2 hours of Nougayrede Bas, have several flights a day from Heathrow, Gatwick and Stansted. Trains run to Cahors from the Gare d'Austerlitz in Paris. Nougayrede Bas is two miles from the hilltop market town of Montcuq, with restaurants, street cafes and all shops for day-to-day living. Cahors, the historic regional centre, is 20 miles off, with a wider range of shops. The River Lot is one of the loveliest in France. Flowing parallel to the Dordogne, its valley is more sinuous, its uplands wilder. Every valley in the region has its mediaeval castle, prehistoric cave, fortified bastide, or pilgrimage town. All have atmospheric restaurants. The local economy is agricultural. The local cuisine is rich and varied. Specialities include duck, geese, foie gras, plums, walnuts. The deep red wines of Cahors, raised on these stony hillsides, were known to the Romans, and have seen a lively revival in recent years. Festivals and concerts are widespread in the summer. Every village has its weekly market and its annual fete, often with fireworks. Summers are very hot. Remember you are on the same latitude as Rimini! However your thick stone walls give good insulation, and your elevated position is exposed to breezes. Booking Notes: We accept bookings by telephone, e-mail or post. It is usually best to ring and enquire about availability, so that if satisfied you can make a verbal reservation then and there. This will then be held for three days. This gives you time to to send us a completed booking form and a rental deposit of 50% of one week's rent. After that, we ask you to pay the balance not later than two months before your arrival date. Changeover Day: All lets start and finish on Saturdays.